Leaving Karasuma St., I turned in a little street called Bukkoji, and found a few meters away from there the hotel First Cabin. Bright hall, well indicated direction, and elevator up to the 4th floor: the door opened on the reception. Both persons of the reception were very kind, smiling, and explained me exactly how works the hotel: pass for the access to the hotel part, location of toilets and my room, other necessary details. I asked naively: «And I also use the pass for the door of my room? » … «It’s not a door, Sir “. Ah, we shall see what it looks like by arriving! 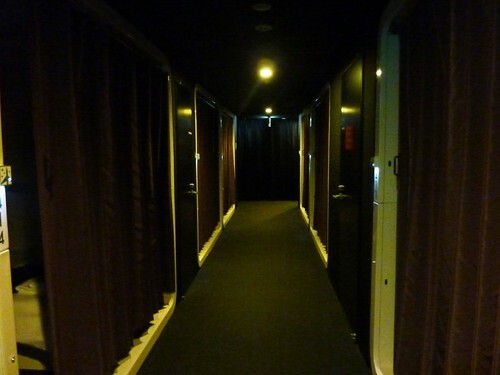 Use of the pass, sliding of the door, and I penetrated into the corridor of the hotel. 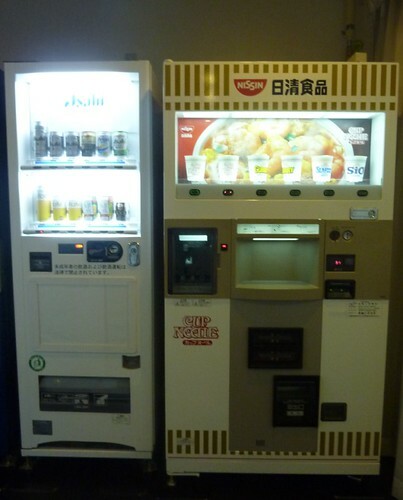 On my right, showers, then a smoker’s place, drinks and noodles vending machines, and finally corridors leading to the rooms. Subdued light, not enough people this evening, big curtains closing rooms, and humming of the air-conditioning: it really looks like being in a plane. 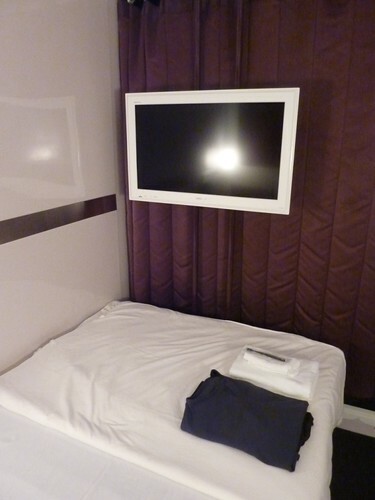 The room is really good, with a big bed and wide flat-screen television. 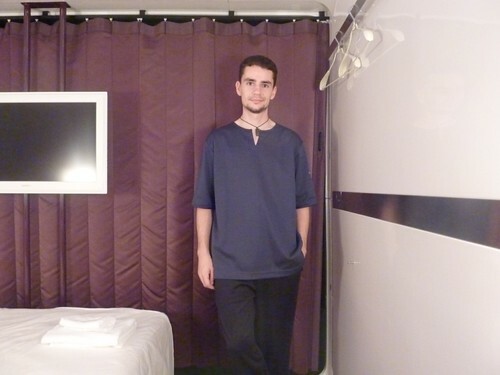 On the bed, there are the really nice clothes and the toilet articles. On the table, instructions for the program of movies “VOD Theatre”. The principle? Buy in the distributors of the hotel a ticket from 1000 yens and use this ticket “to buy” movies directly in your room. Two lamps, on the right and on the left of the bed, are adjustable in intensity, and in spite of the only presence of a curtain (and not of a door), we can feel a certain peaceful intimacy inside the room: we feel really good there. But let’s go and try showers! Toilets are really very well, clean and lit. 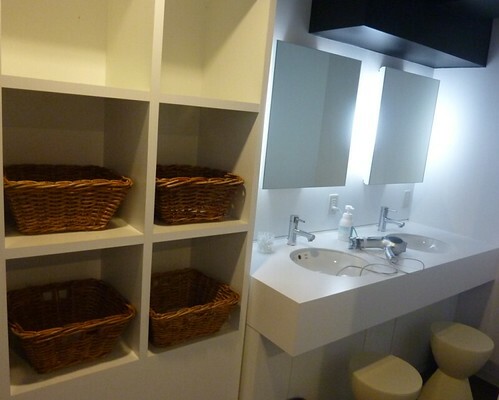 Showers are very spacious, soap and shampoo are supplied, and washbasins with big mirrors and hairdryers are available. 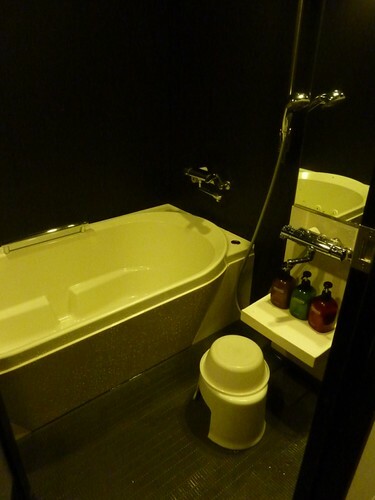 There is even a big bathtub if you wish to relax you a moment! Really this place is one of excellent points of the hotel! Before going to sleep, I went to have a drink in the lounge bar of the hotel. There was a few people this evening in the hotel, thus I was quiet in the bar, drinking slowly while listening cool jazz, in a relaxing and a good atmosphere before going to sleep.I had an excellent night, very quiet, in a really pleasant bed. Everything is very clean and good quality. 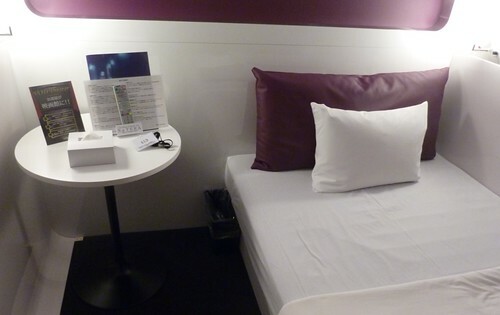 I advise you this First Cabin Kyoto-Karasuma hotel, because I really spent a great moment there! Thanks to the staff for their welcome.